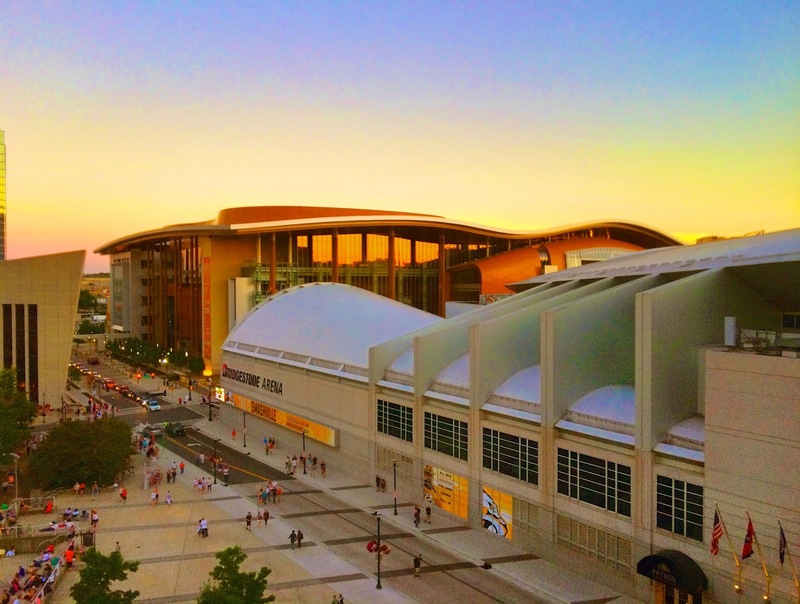 We spent 4th of July in one of our favorite cities, Nashville, TN. We went to the Hot Chicken Festival and took a road trip to Kentucky (I'll tell you about that next weekend). We also ate at all new places and added about 10 new spots that we have to try. We stayed downtown at the Hilton. It is such a great location. 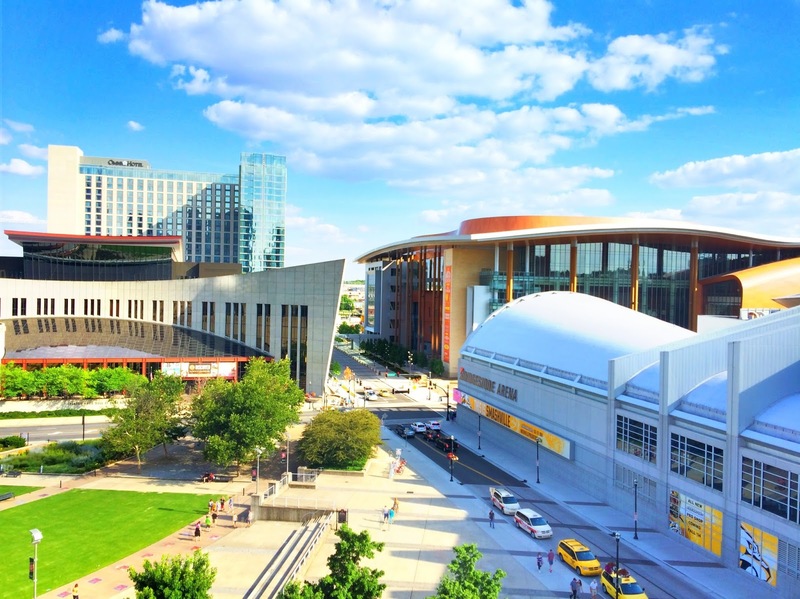 Right next to the Bridgestone Arena, the Country Music Hall of Fame, the new convention center and a block off Broadway. 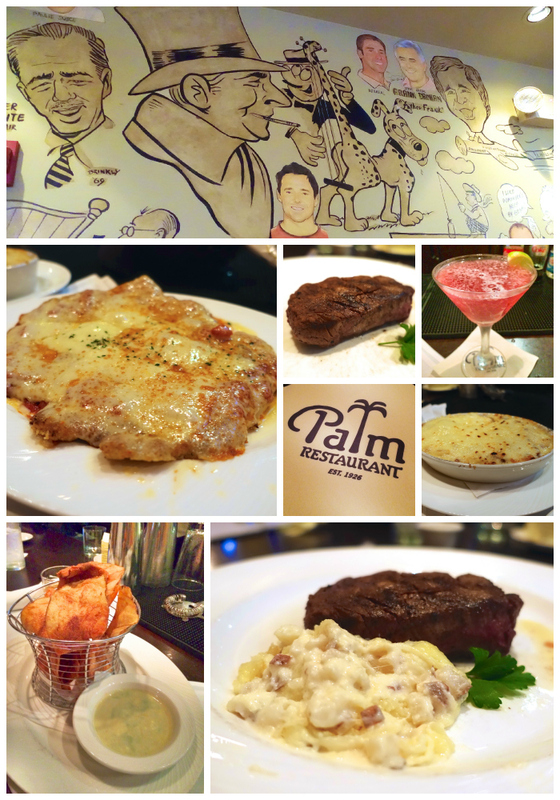 Since we were already downtown celebrating the 4th, we decided to eat dinner in the bar at The Palm. The Palm is in the hotel. That was perfect since we didn't want to have to drive anywhere. We've had drinks here before, but we have never actually eaten here. We started with homemade chips and a bleu cheese dip. YUM! We didn't eat much for lunch, so we were starving. We wolfed down the chips like we had never seen food before. For dinner Chicken Legs got a filet and au gratin potatoes. The steak was good, but the potatoes were out of this world delicious! I got the chicken parmesan. Holy Moly! It was as big as my head and SO good. SO good. Burger Republic has been on my list of places to try for a while. They recently opened a location in The Gulch, so we decided to give it a try. Burger Republic has an extensive beer list. The Kentucky Bourbon Barrel Beers caught our eye. I had recently read about these beers, so I was excited to have a chance to try them. The beers are unique because they are aged in bourbon barrels for 6 weeks. So cool! We tried the Ale and the Stout. Both were good. The stout is brewed with coffee - caffeine and alcohol? YUM! We started with the Tater Tot Fondue - I could have just eaten this as my meal. It was delicious! I got the Tennessee Burger - certified Angus beef burger glazed it with Jack Daniel’s Honey Bourbon and topped with maple glazed Benton’s bacon, Jack Daniel’s smoked ketchup, American cheese and Memphis BBQ rub dusted onion straws. It was AMAZING! I upgraded and got it on a pretzel bun. I LOVE pretzel buns. I also side of Mac and Cheese - it was equally delicious! Chicken Legs got the Shroomin' burger - roasted mushrooms and onions, applewood bacon, swiss cheese, lettuce, tomato and garlic aioli. He got fries. He loved it all! We couldn't pass up the Spiked Shakes. 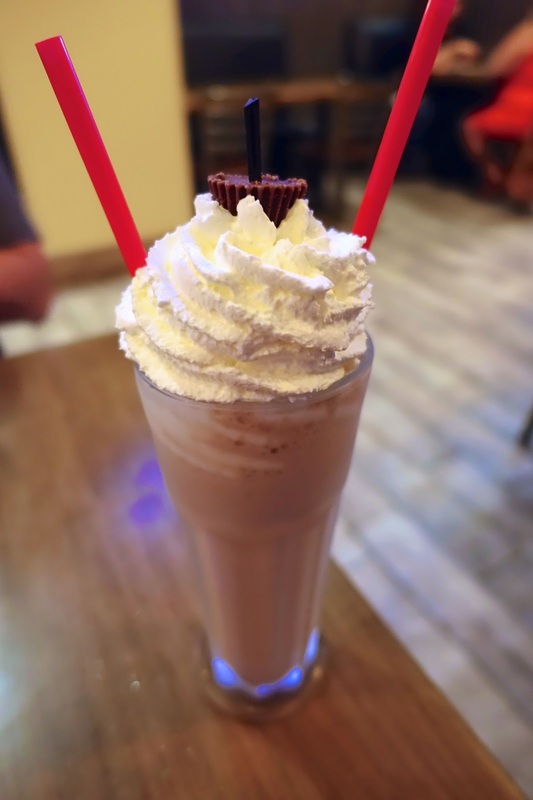 We got the Spiked Reese's Malt - it had homemade Reese's infused vodka. I took one sip and was in heaven! Reese's infused vodka will be happening at my house soon! 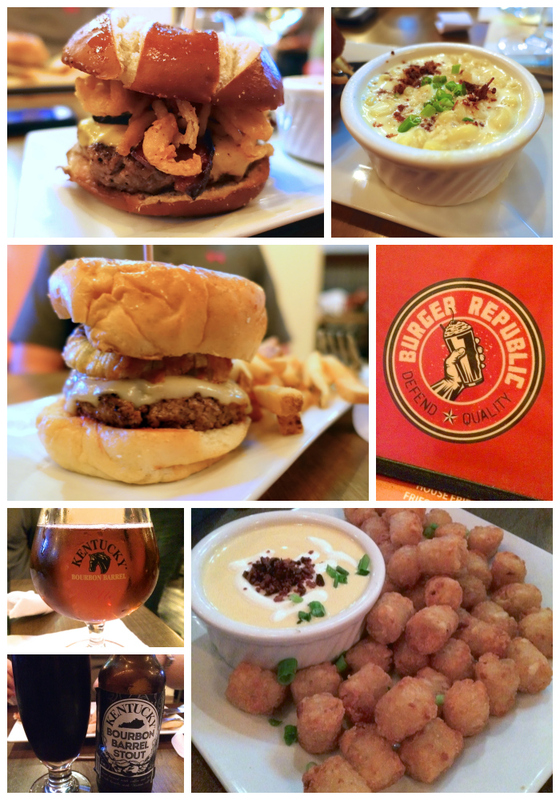 We loved everything at Burger Republic. I just wish I had a bigger stomach so I could have eaten it all! We took in the sites on Broadway. I am dying to try this Pedal Tavern! Watch the video - it is hilarious! 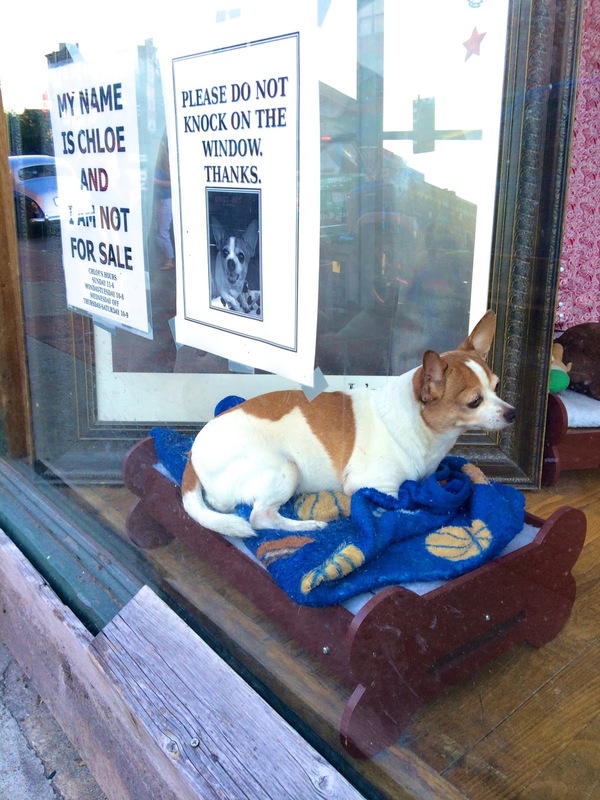 This little dog, Chloe, lives in the window of one the the shops on Broadway. We stopped in at Benchmark for a few drinks. They had live music (of course). The band was good, but I think they spent more time begging for money than playing. She gave us recommendations on places to eat downtown and introduced us to a new liquor - RumChata. Have you ever had RumChata? It tastes like cereal milk. YUM! It is a great mixer for shots. I did a RumChata and Fireball shot and Chicken Legs did a RumChata and Blueberry Vodka shot. I immediately went to the liquor store when we got home and got a bottle of RumChata for the house. Can't wait to experiment with flavors! 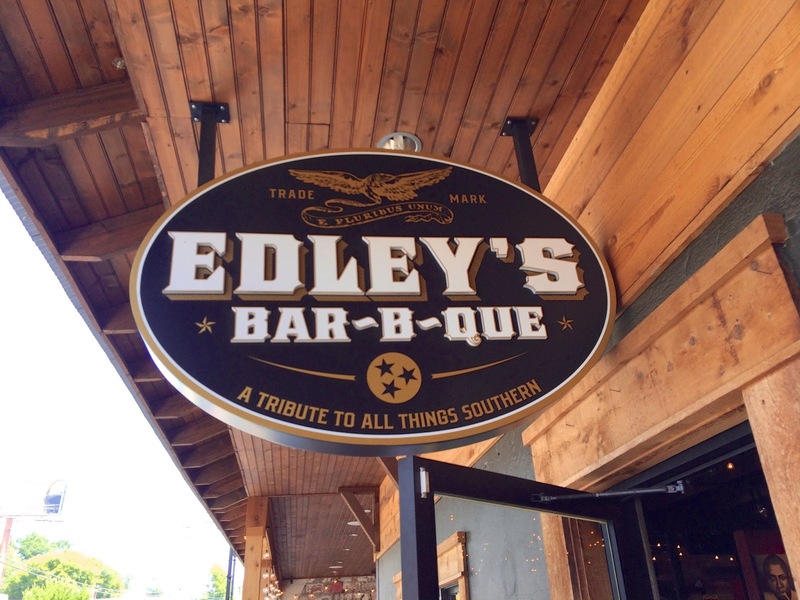 Our last stop before heading home was at Edley's on 12th Ave S.
I've had several people recommend Edley's BBQ and now I know why! Holy Yum! I got the Brisket Sandwich. They had a sign that said they only served the brisket until it ran out. I figured that meant it was good. I was right. SO good. For my sides I tried the Baked Beans and Brunswick Stew. Both were delicious. Chicken Legs got the Chicken Sandwich with Jalapeño Cornbread and Potato Salad. He said the potato salad was the best he'd ever had. Since we were sampling the menu, Chicken Legs sacrificed and got a piece of Pecan Pie. We had a delicious trip! 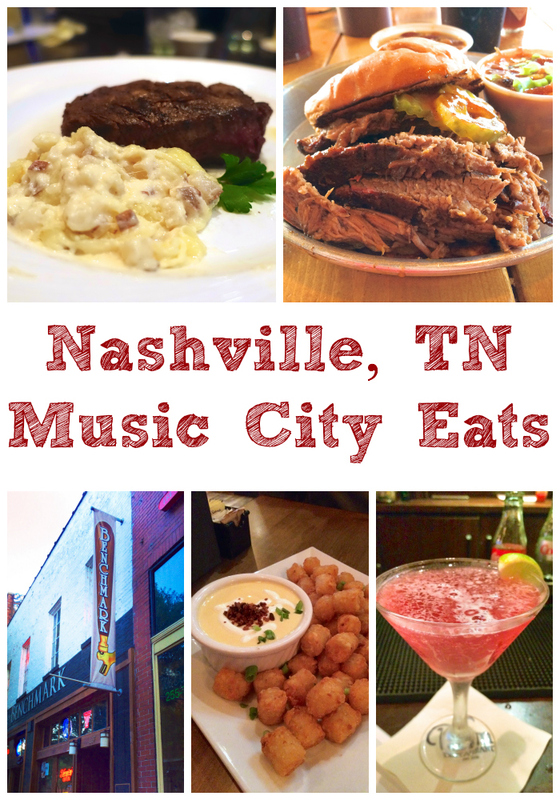 We have also added about 10 more restaurants to our ever growing list of places to eat in Nashville. 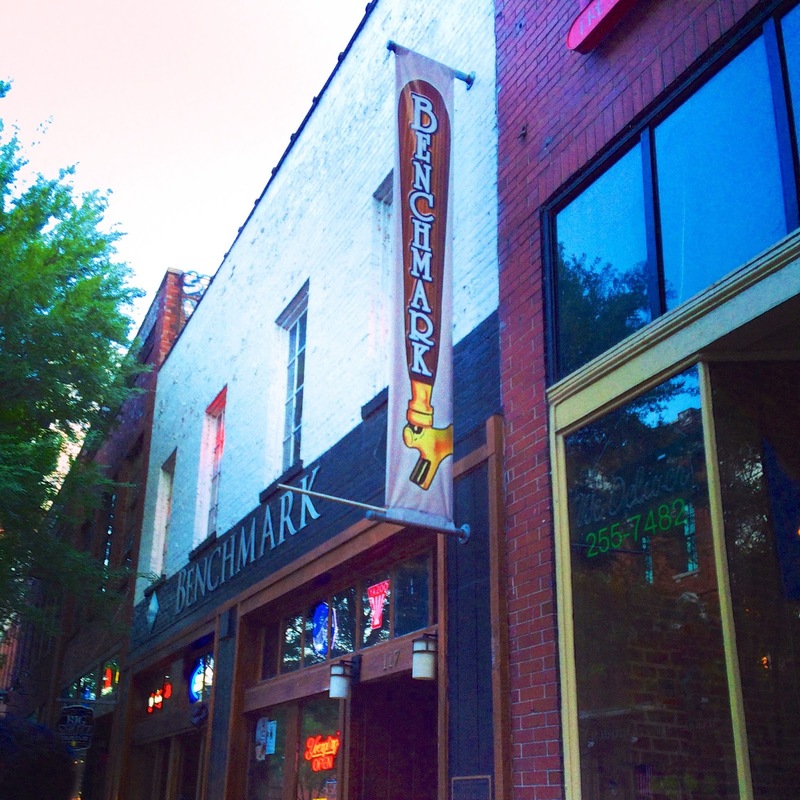 What are your favorite places to eat in Nashville? Can't wait to get back up here! You guys know how to travel and eat - how do you stay so thin? Larry - lots of exercise. I need to kick it high gear - the last few trips are catching up to me! We love Nashville, too! Such a great city and so many wonderful places to eat. Demo's is my favorite place. It's good food and reasonably priced. I used to work in Nashville across from Demo's and put on about 20 lbs eating lunch there so often!! Search Pinterest for Rum Chata hot chocolate made in the crock pot. A fair warning though....it will sneak up on you! OMG! I will search for it now! 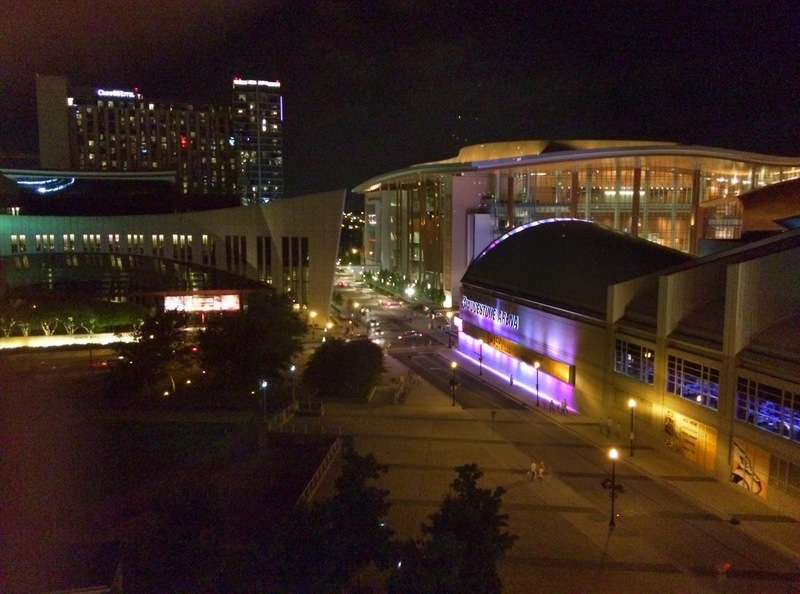 We now live in Nashville and have been for about 10 years. 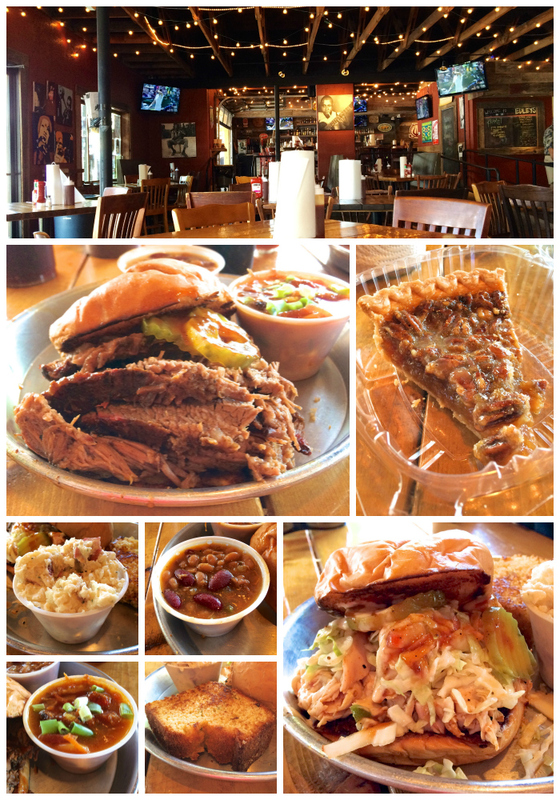 One of our favorite places to eat downtown is Jack's BBQ. It is a little hole-in-the-wall on Broadway. Every time we've been there we've had to stand in line at least 15 minutes. It's that good!! You can't go wrong trying it! Let me know how you like it! Any other places in Nashville you have eaten & highly recommend? Here are some places to put on your list...southern steak & oyster, Kayne prime steakhouse, & jimmy Kelly's...I suggest reservations@ all of them!